Cebu island is dotted with a lot of waterfalls that are worth visiting, and Pinamungajan is lucky to have these natural wonders. 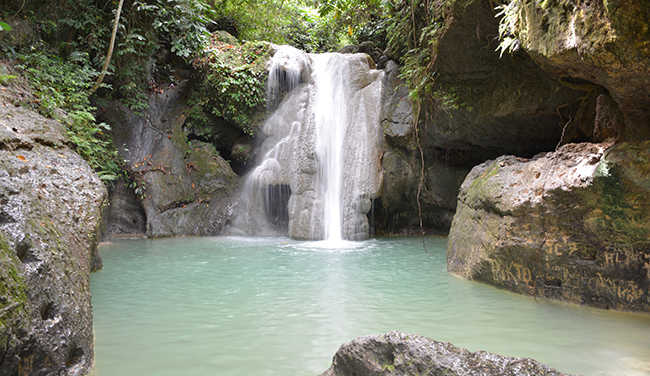 One of them is Busagak Falls which is located at the foot of a hill in barangay Busay. As of the moment, the journey to Busagak Falls is not an easy one and is so unlike other town’s waterfalls which are easily accessible from the national highway. Those who want to visit the falls now, therefore, must be physically fit and ready to tackle the climb up and down the hill. For those who are up for a hike, the trail to the Busagak Falls will surely be a welcoming one. The cool mountain breeze, the green surroundings, and the view of the towering Mt. Canlaon volcano in Negros all combine to give one a feeling of being refreshed and away from the pollution of the urban centers. Going down the hill is quite tricky, you only have the branches and roots of shrubs to hold on to. The place is slippery when it rains. The Municipal Government, however, is already drawing up plans to build a concrete stairs and railing for a much easier trek. One can already hear the sound of the waterfalls while still up the hill. Down the hill, there’s a short walk through the river before the Busagak Falls would come into view. The water is deep enough for a swim. The surroundings, with its huge boulders and thick foliage, is ideal place for a picnic. Just make sure you bring your trash back with you and leave these to destroy the natural environment of the falls. As of now the falls is free for everyone to enjoy.